Pit bulls and other dangerous breeds have attacked children and attacked and killed pets in Petsmarts and Petco.s across the nation. Why they continue play host to this carnage is beyond comprehension. Below is a list of attacks that have been reported in the media and shared witness accounts. Most attacks are by pit bulls but other dangerous breed dogs are included. Notice that Petsmart lost a lawsuit in 2015 and the lawyers representing the victims stated that these horrendous attacks are preventable if Petsmart would require muzzles on dangerous breed dogs. 2018 MI - A beagle had to be put down after it was attacked by a pit bull at Petsmart. 2017 MA - A pit bull was brought into the Hyannis Petsmart for grooming with a muzzle on. The owner was informed that it was store policy that the muzzle be removed for grooming, and the owner said that the pit bull had attacked a dog before, but was "as sweet as can be" with people. The pit bull then proceeded to severely maul the groomer. It was later discovered that the pit bull had severely mauled a woman a few months previously, and that the second victim was a pit bull owner and advocate who had her own aggressive pit bull problems. 2017 PA - A 12 yr old family Bichon Frise named Brewster was dropped off for grooming at the Dickson City Petsmart where Petsmart employees allowed a pit bull to fatally maul Brewster. Petsmart corporate issued yet another statement that they really care about clients' pets that is disproved by their next statemen in which they confirm that they will continue to refuse to ban or require muzzles for breeds that habitually maul and kill in their stores. 2017 FL - Pet store owner's pit mix fatally mauled an 8 week old labradoodle named Buddah. The owner of the Magic Pet Store had the gall to lie about the breed of dog when there are photos of the nasty thing. Buddah's owner had asked if it would be OK for Buddah to greet the pit mix. NEVER NEVER NEVER DO THIS. Asking pit owners if their pit is safe is never an assurance. They will invite you to kill your own dog with no thought whatsoever. And the nasty mauler that killed him. 2017 VA - A six month old pit bull puppy severely mauled a toddler in a completely unprovoked attack at a Virginia Petsmart. All it took was for the pit bull to escape from the training area, and it ran around the store, and instead of seeking love and affection, it sought prey to attack. Yes, toddlers are prey to pit bulls. This is why they are unacceptable as pets. 2017 FL - A pit bull attacked a golden retriever at a pet hotel named TyVy. 2017 TX - A mastiff killed a sweet little bichon named Luna in Petsmart. The Luna's owner is devastated, and Petsmart is mouthing platitudes. Their empty platitudes over the regular attacks on our pets in their stores might suggest they might care more about profit than our pets. 2016 PA - A dog groomer was attacked by a bullmastiff at a Petsmart in South Philadelphia. Medics came and treated her at the scene and then she was taken to the hospital. After the bullmastiff attacked the groomer, it attacked a pomeranian. No word on how badly the pomeranian was hurt. Police say there was no provocation for either attack. 2015 GA - In the same Petsmart where a pit bull was stabbed to stop an attack earlier this year, another pit bull attacked a Great Dane. The pit owner seemed to think it was OK to bring a fighting breed dog into a store so long as she told other dog owners they better back off her aisle 'cuz she didn't know how her pit bull might react. 2015 TX - Family wins lawsuit against Petsmart which hosted an adoption event at which a rottweiler up for adoption launched an unprovoked, serious mauling on a 4 year old girl. Lawyers for the girl said, "This was a preventable injury. Had Petsmart had in place a requirement that potentially dangerous breeds of dogs, such as Rottweiler’s and Pitbulls be muzzled before being brought into the store, this would not have happened. We hope that PetSmart will make a policy change to require muzzles on potentially dangerous breeds inside their stores." 2015 CA - An upscale PetCo brand Pooch Hotel in Hollywood allowed a pit bull to play with other dogs including two french bulldogs. The temperament tested, deemed friendly pit bull killed one of the french bulldogs. 2015 MI - A leashed pit bull bit a PetsMart customer in the store putting a gash in his thigh. The pit bull owner left without giving information. The victim followed the pit bull owner into the parking lot where he saw him get into a Mercedes and leave. According to the victim's lawyer, though at least one PetsMart employee saw the incident, no employees helped detain the fleeing pit bull owner. 2014 GA - A pit bull attacked a westie and wouldn't let go, so the owner of the westie stabbed the pit bull to get it to stop. The pit bull was euthanized because its lung was punctured. The westie had to be transferred to an emergency vet overnight. 2013 TX - An Austin police officer killed a pit bull that was mauling a Maltese in a Petco. 2013 - A pit bull lunged at and mauled a young child in PetsMart. Bitten to the bone, the child lost color and went into shock. A good samaritan tried to block the pit bull owner from leaving before police came, but the pit bull owner pointed gun at the man as he raced away in a truck. 2012 - A Petsmart employee attempted to train a pit bull on a long lead inside the store, but he lost control of it and it attacked a customer's dog. 2010 FL - A pit bull attacked a 4 month old Jack Russell terrier in a PetsMart. PetsMart's chain vet clinic tried to bill the owner for the emergency care they gave the puppy after the attack they allowed to happen. 2009 CO - A yorkie was mauled to death by the PetsMart grooming manager's own pit bull which she had in a city with a pit bull ban, so she lied and called it an american bulldog/mastiff mix. She also lied and told the owner of the yorkie that another dog killed her dog. 2009 - Dog owner reported that their dogs were almost attacked at a Petsmart during a pit bull adoption event and claimed the rescue knew the pit bull had aggression issues. 2008 MD - A friendly beagle/collie mix approached an American Bulldog in a Petsmart and both greeted each other in a friendly way. Then the Ambull killed the beagle/collie mix. 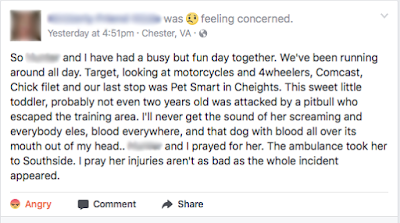 2008 CO - An American bulldog mauled a 4 year old child in Petsmart. 2006 A pit bull mix in a Petco that had been acting aggressively attacked a little dog and attacked people who were trying to save it. The witness said it looked as if the little dog was mortally wounded. 2005 IL - A pit bull killed a yorkie puppy in a PetsMart while both dogs were waiting in line for the vet clinic. The pit bull got loose when the owner handed the leash to the store employee and it made a bee line for the yorkie puppy and killed her in one bite. PetsMart was careful to communicate several times that they were not responsible for the puppy's death, but they paid the owner for a replacement dog.